I just published my post regarding my participation to the Corporate Service Corps, and I got the release below regarding the completion of the project from the IBM Team Philippines. Isn't that great news for the country? Make me so much proud to be part of this organization. 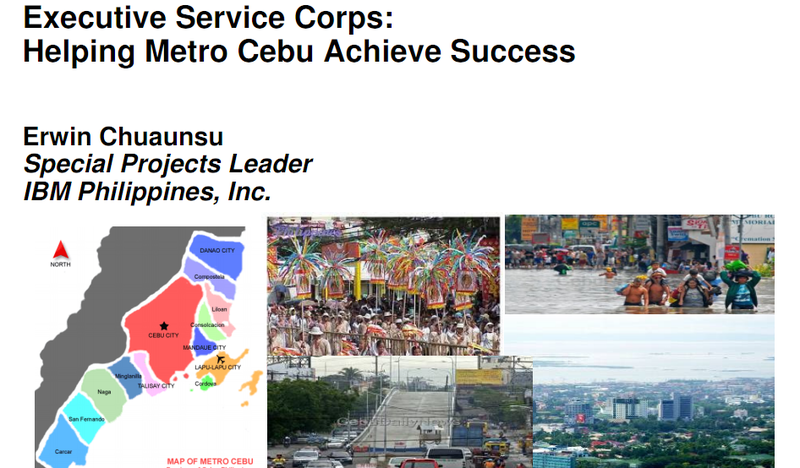 Cebu, 20 October 2011 – IBM [NYSE: IBM] today announced the successful completion of an operational framework project towards an integrated development process, particularly in urban planning and transport & traffic management for Cebu. In the last three weeks, six senior IBM leaders from the United States, Sweden, Germany and Italy worked closely with the various Cities and Municipalities of Cebu Province through the newly formed Metro Cebu Development Coordinating Board (MCDCB). The team is part of IBM Executive Service Corps, a variant of the company’s ongoing Corporate Service Corps pro bono community service program. Since its commencementin 2008, the Corporate Service Corps’ mandate and portfolio have been broadened and deepened. It now includes IBM executives who work in teams with city planners, entrepreneurs, business leaders and governmental agencies to develop road maps that identify the best ideas, most scalable solutions and critical next steps in the economic, social and environmental sustainability of cities. The best of the best. I am more nervous about my assignment..
for plans to move forward,” said Roberto E. Aboitiz, president of the Ramon Aboitiz Foundation Inc. (RAFI). world work — from power grids, buildings and roadways to agriculture and waterways. 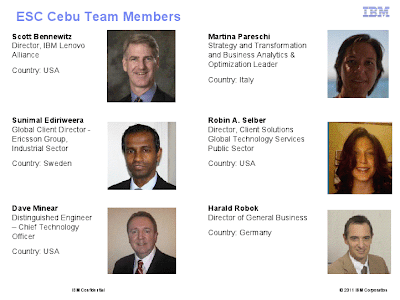 IBM's clients span many different kinds of enterprises and represent every major industry and endeavor.